hoo boy, it’s cold outside! It WAS cold outside. Today the weather is bounding back up to a balmy 24°F around here and that means wind – lots of wind. But before the winds came howling through, we had a couple of incredibly peaceful and calm days. It even snowed (thank goodness). It’s a morning ritual when snow has fallen to check the mountain stats at Eldora, our local ski hill. 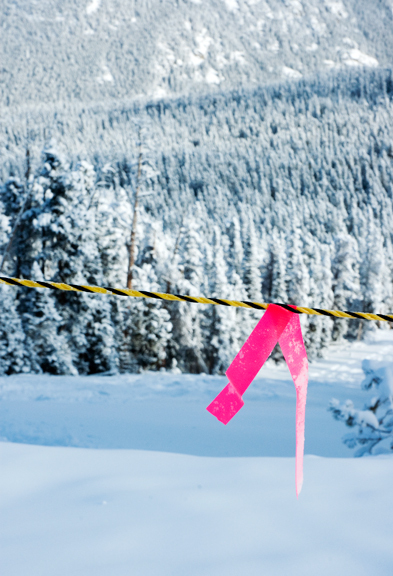 They reported almost a foot of new snow and a current temperature of -6°F. Normally I wouldn’t go near the mountain if they were below zero because our typical winds would make that a less than pleasant experience. But it was a completely calm morning and the sun was shining so… -6°F didn’t sound so bad! We had a solid first day of the season. I know it’s rather late, but if someone can find my snow… thanks. Eventually, the cold did get the better of us and it was time to head home. As my toes endured the painful thawing process in the car, my thoughts turned to some leftover soup I had waiting in the refrigerator. Last month I had posted about a grilled steak sandwich which I love to pair with a bowl of hot tomato soup. So many people asked about the tomato soup! In all honesty, I buy Pacific Natural Foods’ organic tomato soup. It’s one of the few that doesn’t have milk products and actually tastes good to me. But you people shamed me into making my own tomato soup because it seems ridiculous that I have never done it before. I wondered if I could even attempt making tomato soup seeing as fresh tomatoes are many many months away. While I was looking for another recipe, my eyes scanned across the words TOMATO SOUP on the spine of a Fine Cooking issue – March 2008 to be precise. Flipping through, I discovered that I didn’t need fresh tomatoes. In fact, they recommended my favorite brand of canned tomatoes. While I would normally use some of my own homemade chicken broth, I didn’t have any on hand (I’ve been on task to try and clear out the freezer). When you use your own chicken broth, any store-bought variety is inferior, plain and simple. 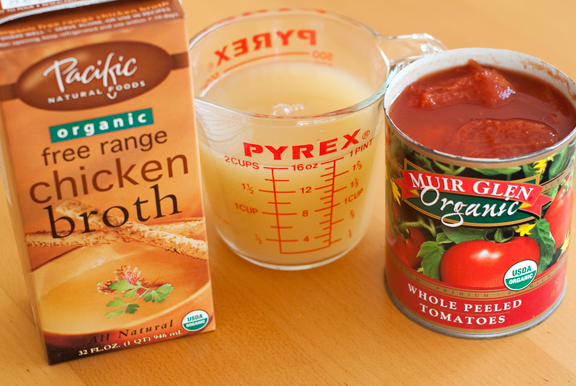 In a pinch, I’ll use Pacific’s organic chicken broth. Had I known that making your own tomato soup could be so easy, I probably would have started making mine from scratch years ago. I particularly like that I can control the amount of salt and sugar that goes into my soup. Most recipes add far too much of both for my taste. So I have a question about blenders… Do the buttons on a blender mean anything? Do they perform different tasks besides the OFF button? Chop, Grind, Purée, Crush, Mix, Blend, Stir, Massacre? I massacred those tomatoes into a purée and had to wonder about that. Anyone? When the soup was ready, so was I. You cannot have tomato soup without a grilled cheese sandwich. Just like you cannot defy the Laws of Physics… EVER. If you’ve never made your own tomato soup, I encourage you to try it. I discovered that I could really taste the tomatoes front and center for the first time without the added sugar and salt that normally plagues most canned or boxed varieties. It’s a little disconcerting to think how some mainstream food brands have conditioned us into expecting tomato soup to taste like a bowl of sodium. Now I’m excited to give this roasted tomato soup recipe a try. 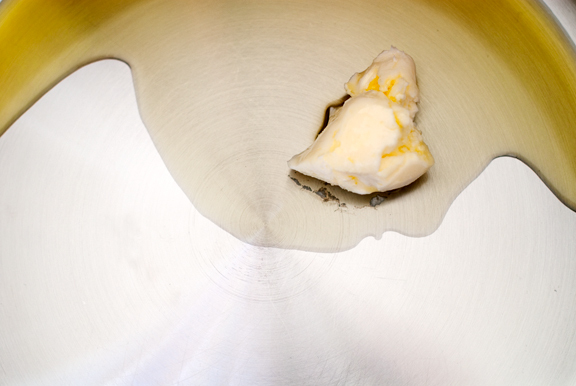 In a non-reactive 5- to 6-quart stock pot or Dutch oven, heat the oil and butter over medium-low heat to melt the butter. 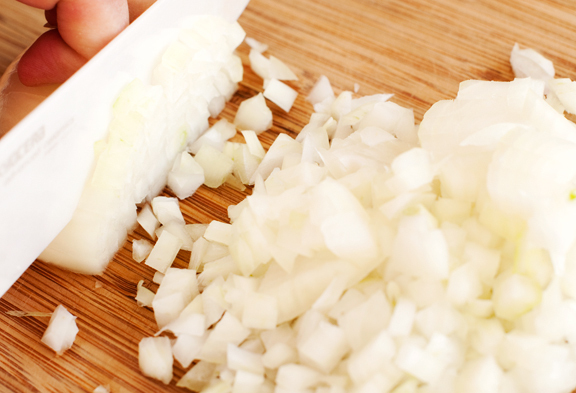 Add the onion and garlic, stirring periodically until translucent and soft. Take care not to brown them (which is what I accidentally did). 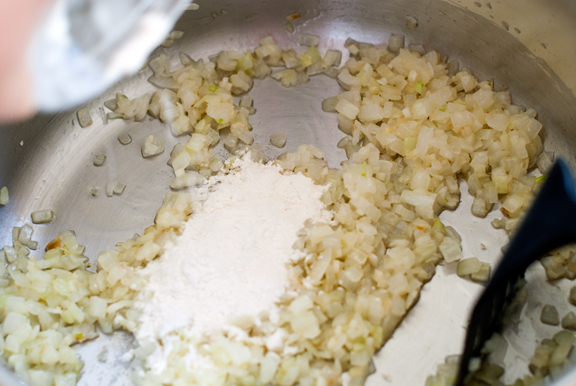 Stir in the flour until the onion and garlic are coated. Pour in the broth, puréed tomatoes, sugar, thyme, and about 1/4 teaspoon each of salt and pepper. 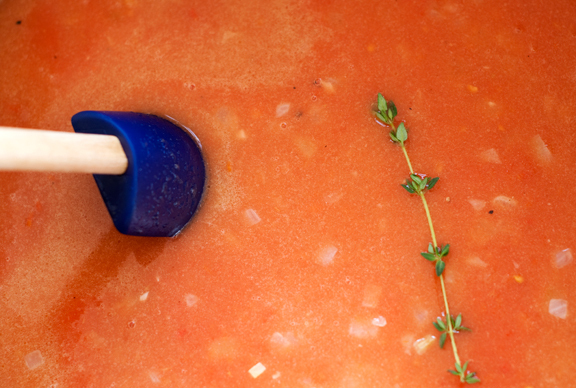 Bring the soup to a simmer over medium-high heat while stirring to prevent any sticking on the bottom of the pot. Reduce the heat to low and let the soup simmer, covered for 40 minutes. Remove the thyme sprig and let the soup cool a little before puréeing it in a blender or a food processor. Rinse the pot (or do like I did and just grab another one) and pour in the soup. Season to taste with salt and pepper and reheat if it has cooled too much. Serve warm, garnished with herbs. Makes 8 cups. It has been on my list to make tomato soup for oh, about a year! I need to get on it. This looks so delicious and simple. 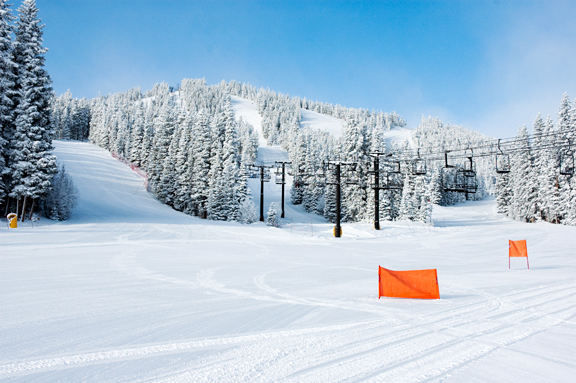 And hooray for the first day of the season! It looked like a beauty. I too discovered the joys of homemade tomato soup. Sometimes I get wild and float a crouton smeared with goat cheese on it. But the other day I experienced the pleasure that only a goldfish cracker can bring LOL! Have you thought about using an immersion blender? I love them, and pureeing in the soup pot rocks! I am TOTALLY making this in winter! Love you URB! Was wondering if you have any opinions about the BMP in canned tomatoes brewhaha that Consumer Reports unleashed on us, when was it, last month? I’ve been trying to figure out how seriously to take it. I honestly hadn’t thought there was anything in this world or out of it that would make me seriously consider canning, and since it’s not tomato season, I’m going to have to figure something else out for the next half a year anyway, if I decide that canned tomatoes aren’t in the OK category anymore. ~sigh~ I keep hoping I’ll be able to talk myself into treating the situation as a, ala cookie monster, sometimes food. Mmmmm… Tomato soup is one of my favorite soups. 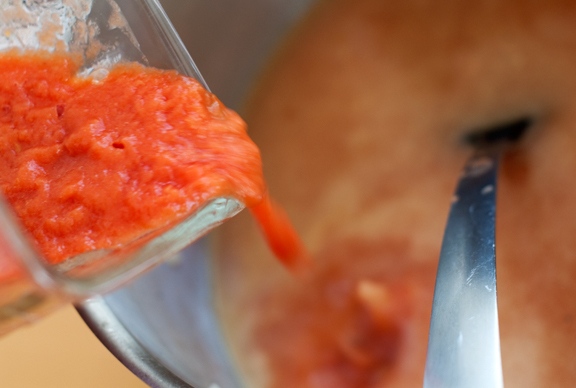 I’m a fiend for tomatoes… (will pour salsa out into a bowl and eat with a spoon like it’s cold soup). Unfortunately I don’t have a blender… might have to put that on my christmas list. Thanks for the recipe and the roasted soup sounds awesome, too! Yummmmm…I am enjoying the first snowfall of the year here in Michigan and that soup will be wonderful on a cold winter’s day! I like tomato soup as much as the next girl, but can we talk about that snow??? Gorgeous, and making me verrry jealous of anyone who can wake up and go skiing. Not that I ski black runs. No sir. But even a bunny slope is pretty when the day is clear and the snow is virginal. I just recently came across a fabulous tomato recipe -very similar except it called for roasting the whole canned tomatoes in a hot oven for about 30 minutes. It adds a punch to tho tomato flavor. Looks delicious! I make tomato soup in the summer with fresh tomatoes and can it for winter eating. All I have to do is add chicken stock, heat and serve. Sometimes I add italian spices, sometimes cayenne pepper, sometimes cream & butter. MMMM, delicious quick garden fresh eating all winter long! Alas, I’ve been defying the law of grilled cheese sandwiches my entire life since I’ve never had it with tomato soup. That looks like the perfect thing on a cold day like today! Looks simple and delicious! Can’t wait to try making it!!! We are expecting some snow today – this would be ideal. I wish I didn’t have so many leftovers in the fridge. I’d rather make soup! I think the different options on the blender are kind of like the amp in This is Spinal Tap that goes all the way up to 11 instead of stopping at 10. Jen – I make tomato soup all the time (I actually roast my tomatoes first). Your soup looks great. You need an immersion blender, though. 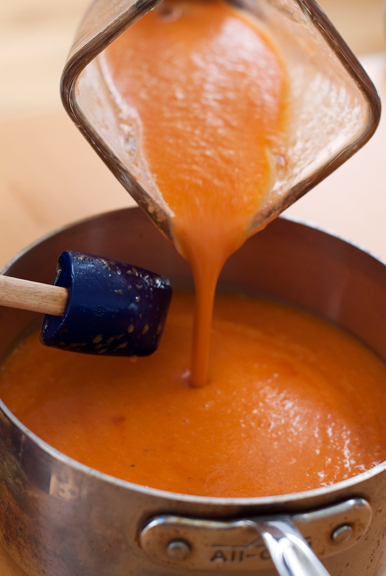 No pouring the soup into a blender -just dip the immersion blender in the pot and whirl. They’re great. I have been waiting for this recipe to come up on URB! Cool that it doesn’t need fresh tomatoes! Cute that your blender has a squarish opening rather than the usual rounded ones. How cool to have an immersion blender to blend soups in a jiffy. I dont have one though. If you ever would like to substitute the cheese sandwich – cut the sandwich bread in cubes, put them in a pan without oil or fat, roast until crunch and golden brown. Eat the soup with this croutons! Heaven! Like you, I first attempted making tomato soup a couple of weeks ago. I was in a hurry for a quick dinner, would have done canned even but in lieu of having that, and now having an urge for it, I made some up. Amazingly good, will never use canned again. I did make some garlic croutons, but then wonder if that’s why I like tomato soup in the first place? You just renewed my commitment to go skiing this year. 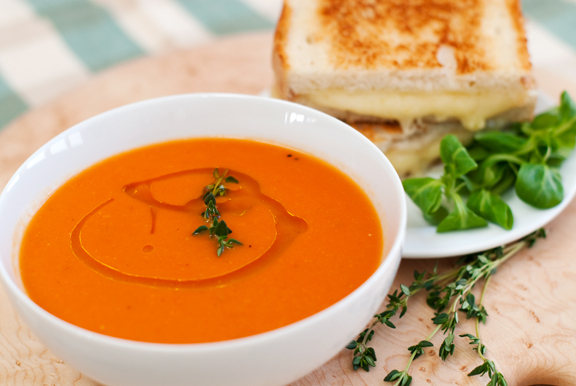 How good would a bowl of that tomato soup taste after an afternoon spent on the slopes? I’m checking URB out early after our first pretty snowstorm while I’m up early to make the last 2 soups for today’s soup party! Roasted Tomato Rice and Lobster Bisque are ready to go. As many have already pointed out, you really need to ask Santa for an immersion blender. They rock! YES- you MUST have an immersion blender in your stocking this Christmas! I agree about the salt and sugar. I would love to make my own to control just those elements. And the blender thing? Yeah, I don’t get it either. I’m making the steak sandwiches tonight for dinner. But with a salad. I’ll have to make my first tomato soup some other cold day. With a grilled cheese sandwich, of *course*. My Grandpa has a good friend who farms tomatoes and is happy to share. So every summer, my Grandpa shows up at my house with 80 pounds of tomatoes! I have made tomato soup many different ways, but my favorite recipe is very similar to yours (except with fresh Roma tomatoes). It’s pure tomato goodness! I froze most of what I made, and now that the weather is cold, we’ve been enjoying it – with grilled cheese, of course! I haven’t tried an immersion blender though, so now I have to find a friend who has one so I can try one out! Thank You!!! I’ll be making it this week as out temps are dipping down near -30 degrees (Celsius). This would be lovely with some olive bread from my favorite italian place…or of course that steak sandwich! I recently tried the Thai spice tomato soup from The Wednesday Chef, which was really tasty (and good to bring to work as leftovers), but my favorite tomato soup recipe is based pretty loosely on Orangette’s chickpea and tomato soup – delicious and filling (especially with a slice of fresh-baked bread on the side). So jealous of your snow! My boyfriend and I are trying to go west for skiing later this winter, and he tends to drool over your skiing photos. Enjoy the snow and blow some over our way pretty please! Although I know people would feel like this is the end of things if we had snow and everyone would stay put since they see it once every 20 years around here!! Adding this to the menu for next weekend, regardless of the temperatures! The snow came last week, and the cold is coming this week. On Saturday we had sunshine, and weather in the 20’s. My 3 year old daughter, my husband, and I spent the day outside. We pulled the sled out and my daughter went for a little ride before we had to go and ride the horse. Will try your soup soon, lately I find tomato soup to be way to sweet. I wanted also to mention that I used Muir Glen Fire Roasted Tomatoes and also added some fresh chopped spinach that needed to be used up! TO DIE FOR! Kids had pasta in theirs. I loved it so much, I’m making more right now in anticipation of a Wednesday snow storm!! Aha! So you DO get cold! Hee hee :) Confession! I’ve never even considered tomato soup that didn’t come out of a can before this. I know, so much a “foodie” huh? :P Boy was I ever wrong! And it even has a grilled cheese on the side, that’s perfect! I made this wonderful, simple tomato soup! And it was delicious. Adding the fresh basil to the bowl gave it an extra boost of flavor. My daughter said it was the most flavorful tomato soup she’d ever tasted. And grilled cheese sandwiches made it a nice homey meal. Thank you for the post! Yup, it looks like I need to get myself an immersion blender, no? :) Love all you gadget-savvy people! Lulu – I wasn’t aware of it, but I’ll definitely have to look into it. Thanks for the heads up. Maria – I couldn’t agree more! yum. Maya – you are so welcome! I made this today with great success! 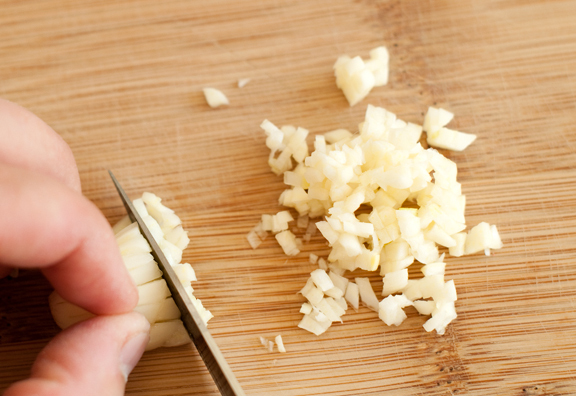 What a great basic recipe to have in anyones repitoire! I added a parmesan rind to it while it simmered to give it a bit more depth. It was delicious. I also followed suit with a ciabatta/gruyere grilled cheese. Brilliant! It was like being a kid again – only better! Thanks so much for the recipe! My name is Megan Smith. I’m with a production company in Los Angeles, California. We are currently working on a segment for the Travel Channel and we’re in need of a roped off area in the mountains. I came across your photo you have posted and we’d love to possibly non-exclusively license the photo. Please contact me!